An hour and a half north of Sydney lies the Central Coast with it's many beaches and salt-water fed lakes. 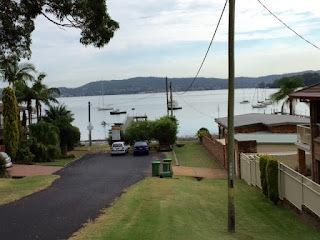 After a scenic drive through Ku-Ring-Gai National Park to see colorful wildflowers and white gum trees; we arrived at my brother's home in Saratoga; one of several waterside towns on Brisbane Water. 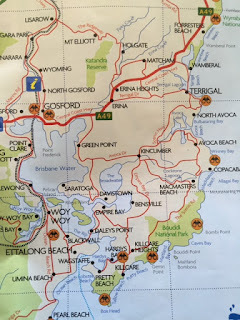 The map best describes my 10 day stay. I rode the bus to Erina Fair Mall one day; riding back just as the school bell rang. Students ride public buses in Australia; so I was delighted when the headmistress led them on, made sure they found seats and wished them a good afternoon. Several got off at my stop....the corner near my brother's house...and there he was, waiting with his neighbors for us to arrive! Another day, we all took a Central Coast Ferry to Woy Woy for mid-morning coffee. 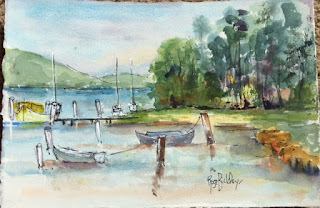 My sister-in-law is an artist; remembering the pictures I snapped here and there from the boat and presenting me with her paintings of the images when I left. Each community has a unique vibe and Woy Woy's is an alternative, sustainable, homemade and handmade, all-inclusive kind of town. I wasn't disappointed in my daily dose of decaf Vienna and scone! It was brelly weather many days; but I walked the wet sand at Terrigal and Avoca Beaches anyway. Barramundi fish and chips at seaside cafes along the shores of the South Pacific were the best. Back in Saratoga, I watched for hours as the lorikeets, cockatoos and other feathered friends ate, bathed and visited. The welcoming country life and family routine was perfect. We spent a weekend on the northern coast of New South Wales; visiting my niece and her family in the town of Kempsey. 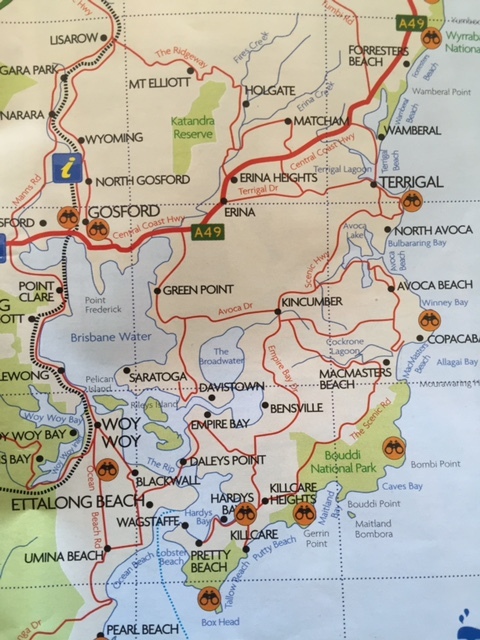 A four hour drive up the Pacific Coast Motorway; I noticed the rope caged bridges across the highway; possum and koala crossings! Amazing to me that the animals caught on to this; roadkill has been reduced to almost zero in the last few years. I also noticed road signs that said "Stop, Revive, Survive" every so often; reminding motorists to take a break every two hours. This is true all over Australia because of vast distances between places. 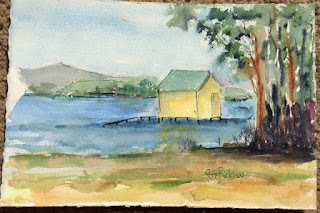 We complied at the quaint little Art Cafe on pasture land along the Ghinni Ghinni Creek near Taree. We ate BLAT (bacon, lettuce, avocado and tomato) sandwiches outside, listening to the cows moo and admiring the yard art. Can you see the frames hanging from the tree? Early morning and we're off to the remote little village of Bellbrook in the Maclean River Valley. The kids loved playing on the rocks and my niece pointed out photos of ancestors in the old hotel. There's still a primary school for locals and the general store where we had lemonade. Vast does not begin to describe this gigantic country. Most of the population lives along the coasts; the middle of Oz is arid and remote...the Outback. But in between are these small country towns; reminiscent of out-of-the-way places all over the world. No tourists; no big box stores or hotels...just real life, happy people...my people! How lucky to have this balance to my time in Sydney and Uluru. After ten days; the teary goodbyes began. It was time to move on. My Aussie rellies drove me to the Gosford rail station. I wanted to continue using my Opal Card...the transit card for all NSW residents and visitors. Initial coast is $15 which gives you rides on ferries, buses and trains. It can be easily topped off at kiosks around the state. I had plenty left on mine and got an express computer train back down to Sydney. My luggage was less of a struggle now that I'd shipped a box home with souvenirs and books....my biggest weakness. I loved the purple interior and smooth ride along the water for much of the trip. Central Station is as 'grand central' as you can get and it took lots of asking 'which way out" before I found my way to the street. On my own but never alone is how I looked at it. Not only did friendly locals point and give directions, a cute little teenager led me straight to the exit. Missing my family as I write this; recalling so many funny, laugh-out-loud moments with my talented sister-in-law, quiet evenings on the veranda with gin and tonics, the different foods I tried....to their delight. ("Joanie is so picky" is universal!) I'm grateful for the time spent living the life my brother lives; catching up after 14 years and meeting more family all over coastal New South Wales. I have another niece in Perth, in Western Australia....next time, mon cherie! Thank you Rose. You can read more about her art, books and classes here. What a lovely trip! I felt like I was right beside you. It's a travel diary that I so enjoyed. I'm so happy for you and wondering if you could ever picture yourself living there. Big hugs. Thanks, Cathy...a good description of how I write...diary style! We tried to move there and had jobs lined up years ago....but we were just 46 and the cut off date then was 45 for immigrants/work visa. Hopefully I'll make it over once more in a few years to see family! What a fulsome trip! I continue to be inspired to go there, myself, as I continue to read these wonderful descriptions in your posts! I have left over AU dollars, $ on my Opal card and a bug net...yours if you decide to go! LOL Thanks for commenting...I love the word Fulsome! What an amazing trip! I would love to visit Australia. Hope you can someday, Rena! It's so worth the long flight! Thanks for reading me; hope you'll be at BAM in a few weeks my sweet friend!